Bobby Brown made “My Prerogative” a huge hit in the 80’s. Then there was the whole Whitney Houston marriage debacle and well, you know how it ended. Not pretty. The point is, we rise; we fall. For most of us who lead lives that do not warrant celebrity status, we survive the falls and learn from them. 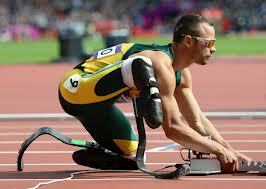 Now, Oscar Pistorious, who probably gets the 2013 award (so far) for how the mighty fall, is out of jail on bail. His next hearing is JUNE. Do you believe it will take five months for the next hearing to take place in this case? Guaranteed, come June, we’ll see more courtroom photos and video of the prized Olympic fallen star weeping into his hands. Guilty or not, somehow, he’ll come through this terrible tragedy. For you and I, we trip over ourselves; screw up and with absolutely no fanfare, pick ourselves up and start all over again (strike up the band). Mundane dilemmas such as losing the cell phone and finding it again; then Verizon messing up and deactivating your found cell phone. Test results showing no, your hip replacement device is not lethal – just not yet – you’ll have to wait a while to see if it becomes lethal. These are the things that on some level – you and I deal with every day. No one notices; the cameras do not roll and our lives go on. I talked to a neighbor today who has ripped the ACLs in both knees and one meniscus. She’s going through some painful physical therapy but knows she’ll have to have surgery on both knees at some point. We live in limbo week-to-week. We just don’t know what good and bad will come of just about anything we do. The good news is – most of us are survivors. We pick ourselves up; dust ourselves off and simply move on. And that my friends is how our lives are meant to be. No cameras; no You Tube; no recording. We live and learn – and move on. My prerogative is to be sad and frustrated and then get over it on my own terms and hope that everyone around me understands. And if they don’t – well, life will indeed go on. When you try to get something done, you hope that things go smoothly. Obviously, life throws curves at you all the time. I talked with two lawyers today about my hip replacement recall and what comes next. I have two appointments to meet with the lawyers and decide how to proceed. The one attorney is more experienced in these cases, but he leaves me with more questions than answers. The main problem that I have to wrap my head around is that I probably have to have another surgery – sooner rather than later. You hear about these cases all the time – but never think you’ll be in the middle of one. I wish I could go back and stop what happened to me in May 2011 when I had the first replacement. I can’t. now I wish I could just fast forward and have this all be behind me (no pun intended). I can’t. This will be a saga that will be clouding a lot of my life in the next few years. Goodie.